Back again for another AIM IT Project post. I am going through and valuing all the investment companies listed on the Alternative Investment Market (AIM) of the London Stock Exchange. As usual the home page of the project is here, and the spreadsheet covers the performance. Let’s get to it. Regular readers will be all too familiar with these charts depicting shareholder value destruction. I hope most think twice about investing in any of these companies that appear to have a good story and instead focus on undervalued securities and special situations, or your portfolio performance could look similar to the above. SPPC is a closed ended investment fund that looks to invest in growth companies just before they will float on the start market in an IPO. It holds investments in 39 companies, of which there is a heavy weighting towards mining, oil & gas companies. The majority of its holdings are ‘pre-IPO’ – unlisted investments, as the company tends to sell its stakes after the IPOs. The company has a history of successful IPO’s, generating an aggregate 80% return on these. However this is solely the winners, the company has other investments that have been fully written off. Given market sentiment currently with regard to mining in general I would be surprised if it could make successful IPO’s of a significant number of its portfolio companies. The holdings are quite well diversified so this investment is more a bet on the sector as a whole. SPPC doesn’t give enough financial details of the companies in the portfolio for me to assess their fair value. I did recognise one name, Iona Energy (TSV:INA), which is listed and I have considered purchasing as it’s quite cheap. According to the latest interims the company exited the investment at a small 4% loss, so it appears at least in this case the carrying value of Iona was quite conservative. The company has admin expenses of around £2.5m a year, not unsubstantial for a company with net assets of £66m. I’m going to value the company at 20% less than NAV given the uncertainty and illiquidity of holdings. However I would never actually take a position in a company which doesn’t spell out clearly the earning performance of any of its holdings. Ok, this isn’t quite an investment trust like the rest of these stocks, but investment managers sometimes have substantial holdings themselves in their own funds. 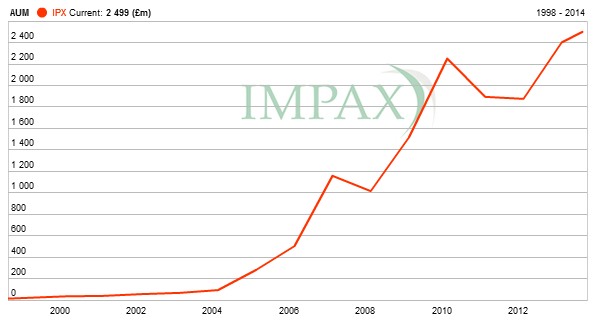 Impax for example has assets under management (AUM) of £2.2bn and almost its entire shareholders equity is made up of cash and seed investments. It has grown AUM strongly over the last 10 years by focusing on environmental investment funds. Around a quarter of AUM are in closed ended listed trusts, so the risk of falling AUM is reduced for these at least. Private equity funds make up the rest, and majority, of AUM. Valuation of asset managers is usually done as a % of AUM, but for this company I will value it based on profits. Free cash flows after share buybacks (to pay for the very generous employee options scheme) have averaged 1.5x reported profits over the last 5 years. The share count is increasing at almost 2% a year despite large share buybacks so despite growth I will value this company at only 10x FCF, or a P/E ratio of 15. Adding in net cash of £26m that gives a value of £70m, or 55p per share, roughly where the shares trade at currently. Now for an unusual fund that invests (or rather trades) in environmental instruments. The fund is winding down and trying to realise its illiquid private equity and carbon credit investments to return to shareholders. The chart above is a little misleading as the fund has recently been returning significant cash proceeds to shareholders, but its gives the general idea that the fund has performed poorly. The 2013 annual report details some of the sales of its private equity investments in 2013, which caused a revaluation of its book to about 70% of what it was originally. Management claims that the intrinsic value of its private equity investments exceeds book value, but it said that in 2012 before writing down the holdings in 2013. 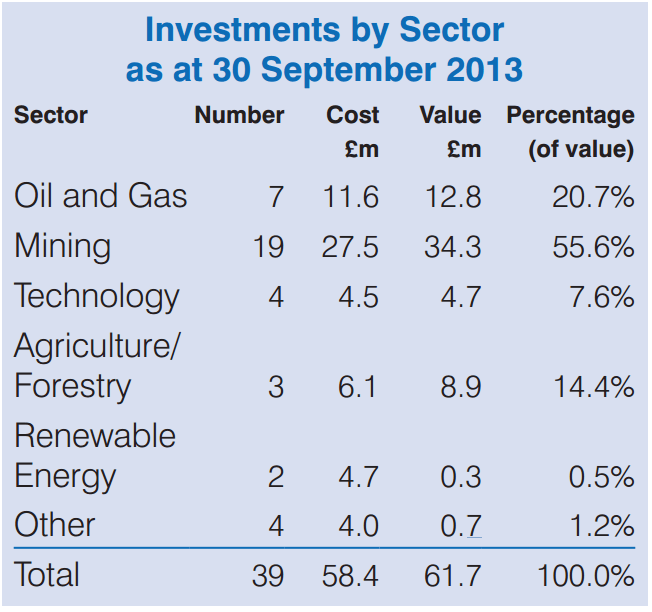 Its carbon portfolio is actually a liability, only -£0.4m in 2013 but was previously -£17m. A recent filing said that they have disposed of this portfolio for no consideration, although it is not 100% clear to me whether any possible liabilities remain. The company’s admin fees are circa £5m a year, with investment advisory fees of £4m. I have no idea why they need to have such high advisory fees when in wind down, but it’s a big drag on a stock with a market cap of only £40m. So to value the company I’ll take cash of £22.7m (£60.2m – £37.5m dividend paid since last report), add on 80% of the private equity book value – £42.7m (which values it conservatively at around 10x average earnings) then minus liabilities of £5.9m to get a final value of £59.5m, or 23.8p per share. That’s all for now, I’ll carry on through the list in the next edition.